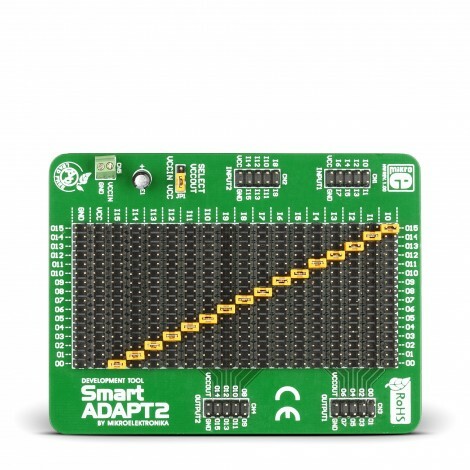 The SmartADAPT2 Board is an accessory board used to rearrange 16 I/O pins just by moving on-board jumpers in order to meet your specified needs. This board is ideal for configuring your prototype device I/O pins. SmartADAPT2 board features 32x16 header matrix with 16 jumpers which are used to manually route desired input lines to appropriate output headers in order to form a new pinout arrangement. Board is equipped with screw terminals if you want to provide external power supply, instead of using one from input headers. Both input and output headers are compatible with mikroElektronika development and accessory boards. Key Benefits Flexible solution suitable for all MCU architectures. Board helps you to overcome certain connection problems in covenient and easy way.